To the streets: Eleven members from Majoretteketet will walk around Hoàn Kiếm Lake from 2pm to 6pm. Photo coutersy of Belgian embassy. HÀ NỘI — Eleven members of the Brussels-based Majoretteketet will perform at the event A Touch of Belgium at Lý Thái Tổ Statue Garden on May 12. The dancers, made up of ten women and one man, will perform some of their most well-known parades three times around Hoàn Kiếm Lake from 2pm to 4pm. They will also have joint performances on stage from 5.15pm to 6pm with the Pinky Cheerleading Squad of Vietnamese students from Foreign Trade University and Hà Nội Be Singer Club. 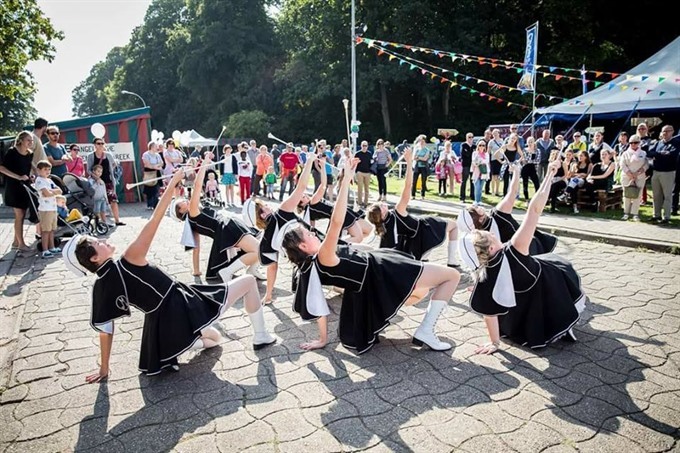 Majorettes are dancers whose performance softly balances between dance and street theatre. Their choreographed dances are shown in public spaces and use influences of folk dancing. They are accompanied by a vibrant and upbeat marching band. The majorette’s performance is a part of A Touch of Belgium which is organised by the Belgian Embassy on the occasion of the 45th anniversary of diplomatic relations between Belgium and Việt Nam. Coming to the event, people will be greeted by the beloved Smurfs – who are celebrating their 60th birthday this year. The Smurfs were originally created by the Belgian illustrator Pierre Culliford in 1958, and have since conquered the world of animation. During the event three classic Smurf cartoons will be screened in English with Vietnamese subtitles from 2pm to 4pm on the main stage. Other Smurf-related activities like colouring and drawing will take place in the two designated creative areas. The smurf presence is organised in collaboration with Wallonie-Bruxelles International, who are simultaneously hosting the Heritage Exhibition on The Smurfs at the Imperial Citadel, on 19 Hoàng Diệu Street. The Hanoi Brass Band will take the stage from 6pm to 6.30pm, followed by a 20-minute performance called Exploring Connections, performed by talented Belgian dancer and choreographer Nick Coutsier, together with the dancers of Hà Nội-based Kinergie Studio. It is a fruit of their week-long contemporary dance workshop. A performance by Belgian DJ Simon Medard and live visuals by producer Daniel Day Long will take place from 7.15pm to 10pm. DJ Medard will stir up the atmosphere throughout the evening with live upbeat music, coupled with striking visuals. Activities for children such as gardening, art and crafts will be offered at the event.